Firstly meet Kaos: the fence builder, the landscaper, the loom buddy, the source of cheap entertainment (He’ll keep catching that ball just however long you want to throw it.) He’s my son’s, dog. Kaos will be staying with me for a bit. 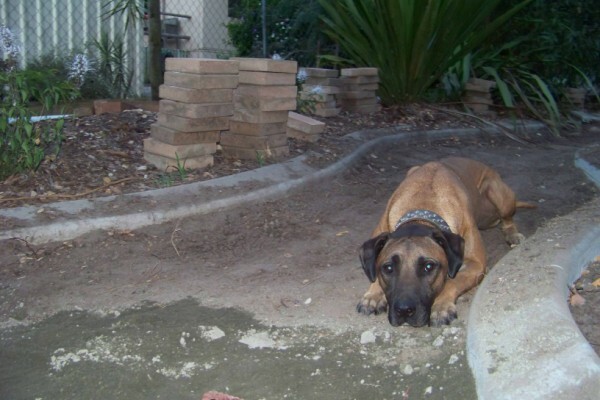 I have been very busy landscaping the back yard. Kaos had ploughed up the lawn for me. This is progress so far. After Kaos had ploughed up/wrecked the back garden it was time to fix up the disaster. 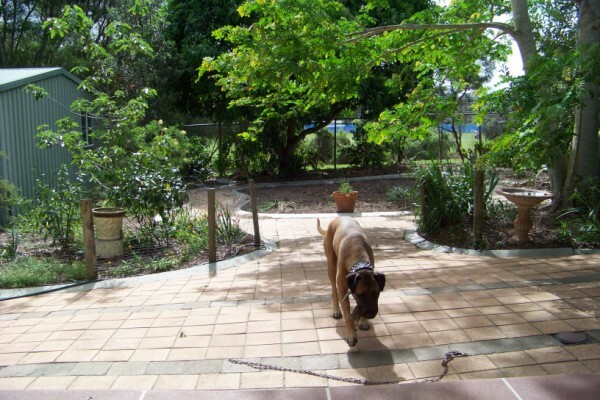 I have redesigned a new garden path that follows the existing garden. Then had a concrete edge laid before digging out and laying pavers with a gravel fill. I must admit it looks great so far. It’s also just the thing to do on hot summer days! I am looking forward to planting. I have also been busy weaving both on the 24 shaft computer assist and drawloom. 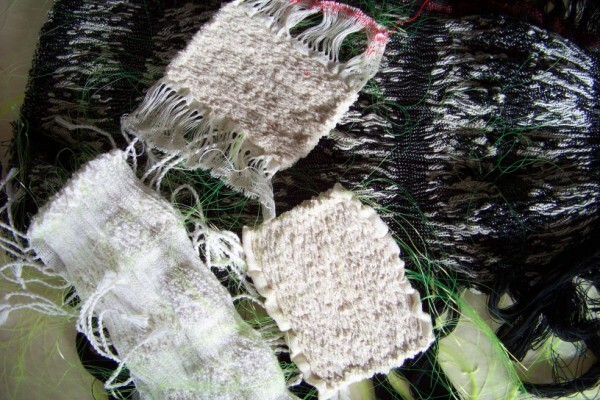 There is a collection of scarves and fabrics that are pulled up ready to dye. The large piece is the damask that is shown above. I hope to get an indigo bath happening in the next few weeks. On my 24 shaft loom, I woven a fabric length that explored a combination of techniques. 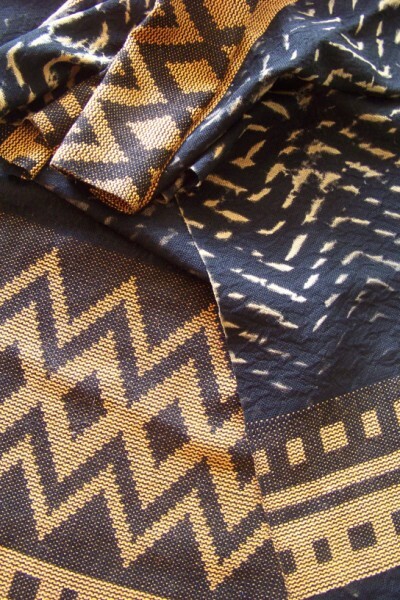 The original source of inspiration was patterning on ethnic fabrics that often combine uneven woven bands and in addition some interesting dye patterns. 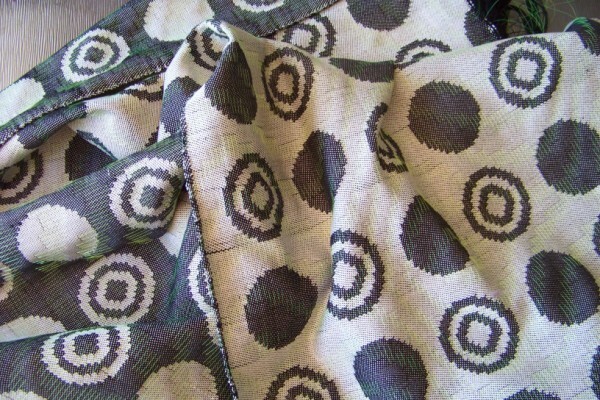 I wanted to combine supplementary weft patterning with warp shibori. 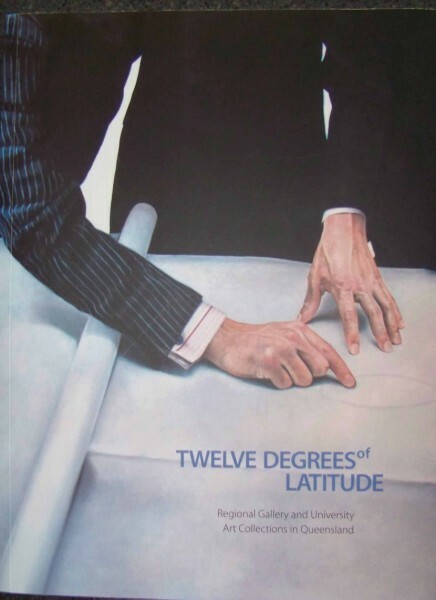 I have just realised that I haven’t shown a picture of the catalogue of “Twelve Degrees of Latitude”. It is a touring exhibition by Museums and Galleries Services of Qld celebrating Q150 with works selcted from Regional Gallery and University Art Collections in Queensland. “Which Way” was selected from the Redland Regional Art Gallery Collection. I was thrilled to be notified that it was included. A touring schedule is listed on my web site www.kayfaulkner.com.au. I do suggest that if you wish to see the exhibition, that you check whether the work is hung as this exhibition is extensive and smaller galleries will select work to be hung to suit their space. Last week I went to see the lighting installation by KT Doyle . Check out her blog at http:// ktdoyle.blogspot.com. The installation is in Briggs lane in the Brisbane CBD. I have been following her progress with the project so it was great to see the final outcome. You are currently browsing the Kay Faulkner's Blog blog archives for February, 2010.